Naturally gluten free, beans are more than just a musical fruit; they’re tasty, versatile and offer a wide variety of health benefits. What are beans, really? Beans are seeds from flowering plants in the “Fabaceae” family and fall under the “legume” classification. They typically grow inside pods. Aside from beans, other legumes include peas, peanuts, and lentils. 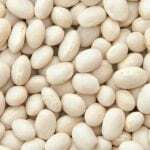 There are a variety of beans, including but not limited to: lima beans, black beans, soybeans, kidney beans, garbanzo beans (chickpeas), navy beans (white beans) and Romano beans (Italian string beans). Personally, I love creamy hummus, hearty pea soup, cooked lima beans and chili with beans. A benefit of bean flour is that it helps make baked goods moist and soft. Queen Street Bakery makes one of the only bean-based loaves in Canada. Their White Bean & Millet Seed loaf, Romano Bean loaf and White Bean & Grape Skin loaf all contain the goodness of beans as they are made with bean flour. Here is more information about the bean flours found in these scrumptious, premium loaves. White Bean Flour is rich in minerals with a mild taste and smooth texture. Navy beans (a type of white bean) boast a wide range of nutritional benefits, such as cholesterol-lowering dietary fibre, quality plant-based protein and vital bone-building minerals like magnesium and phosphorus. These beans are also a good source of vitamin B1 (thiamin), vitamin B9 (folate), manganese, copper and iron. This profile makes white bean flour a nutritious, mineral-rich and versatile gluten-free ingredient. Romano beans are a rich source of dietary fibre and quality protein, which is good for your metabolism and helps to keep you feeling satiated for longer periods of time. Their fibre content also helps to keep blood sugar levels in check. 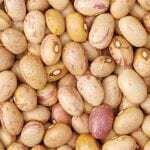 These beans help to reduce cholesterol, making them good for your heart. With the additional benefits of potassium and iron, Romano beans make a flour that packs nutritional punch! What Makes Beans so Great? Beans contain several important nutrients, including folate (vitamin B9) which can help prevent neural tube defects in pregnancy. Folate deficiency can cause an assortment of unwanted symptoms. Beans also contain: fibre, zinc, iron and magnesium. So eat your beans with every meal! Beans are high in amino acids, which are the building blocks of protein. Consuming beans with healthy whole grains, nuts or seeds can create ‘complete’ protein. You need complete protein, an essential nutrient, for virtually every job your body does. You could say beans help get the job done. Beans are rich in polyphenols (a powerful antioxidant). Antioxidants fight free radicals, which are chemicals that negatively affect your body and have been shown to play a significant role in the development of chronic diseases. Black beans have been shown to have the highest antioxidant activity. Beans are powerful. It has been shown that consuming beans is linked to a reduced risk of death a heart attack, stroke, and other cardiovascular problems. Some research suggests beans are linked to lower LDL (bad) cholesterol levels. Another reason to love beans. Beans have been shown to help stabilize blood glucose levels and have even been shown to help prevent diabetes. Their high fibre content can help lower and stabilize your blood glucose. Now that’s sweet! Research has shown a variety of beans, especially black beans, enhance gut health by improving intestinal barrier function, and increasing the number of healthy bacteria. This may help prevent gut-associated diseases. Last but not least, beans are satisfying and satiating. The protein, fibre and starch in beans can help keep you feeling full longer than other foods and can help prevent food cravings. This may prevent overeating and can help you achieve healthy weight loss, if medically necessary. Now that’s satisfying. About the Author: Living with celiac disease, Lisa Cantkier is a writer and educator focused on nutrition and health.